In 1972, 132 delegates from throughout Louisiana gathered in Baton Rouge to begin the process of writing a new state constitution. They studied, worked, and quarreled for more than a year before completing their work and submitting the proposed constitution to the public in a referendum. In April 1974, the new constitution was ratified by the people. Last month, on the 40th anniversary of the signing of the new constitution, the delegates held a reunion and reminisced about their accomplishment. Only 52 of the 132 delegates are still alive, and many are in poor health. About 40 attended the reunion which was held at the World War II Museum in New Orleans. It was a fun-filled evening. Old friends got reacquainted, and each delegate had the chance to take the mike and tell his favorite stories. 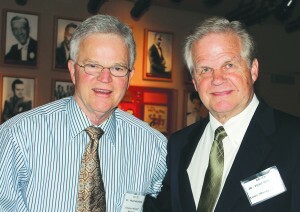 The event was organized by chairman Bubba Henry and hosted by delegate Boysie Bollinger. For photos, go to centralcitynews.smugmug.com.